a one-pot 30-minute (ish) soup recipe full of delicious mushroom flavor! This gourmet mushroom soup recipe features 2 kinds of mushrooms and a “secret” ingredient. 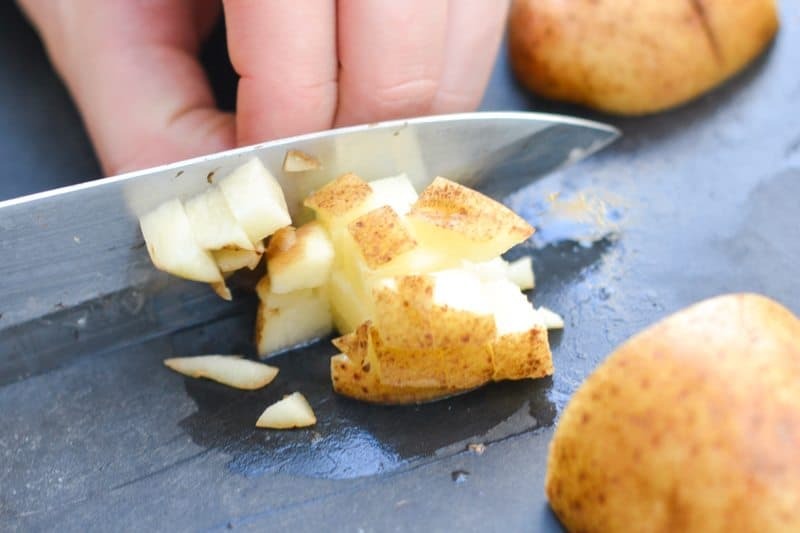 It is easy, fast, and absolutely delightful! 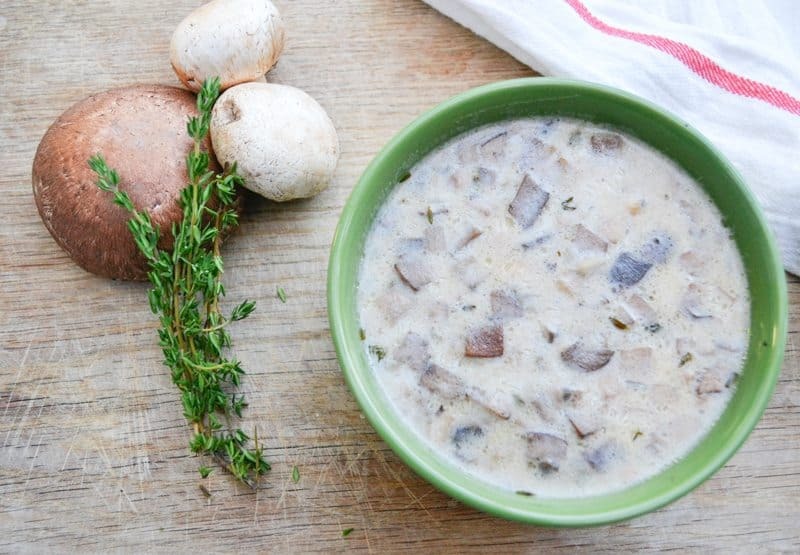 Upgrade your creamy mushroom soup to this delicious recipe. Have you noticed when you add the word gourmet in front of any recipe title it sounds harder? It makes the recipe seem a bit scary. Run away…run away it screams!!! But that isn’t true with this Gourmet Mushroom Soup Recipe! 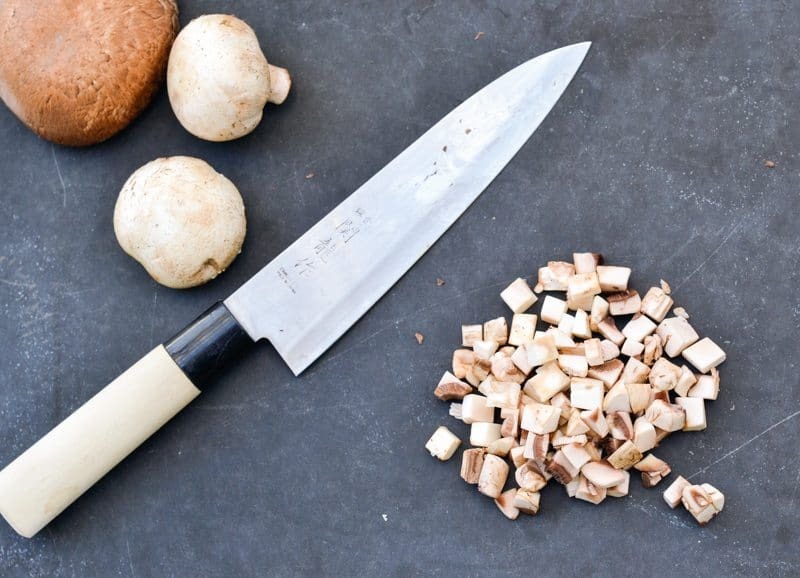 If you don’t like mushrooms obviously you won’t like this…obviously!! Don’t try it, you will be disappointed. But if you do like mushrooms? You’ll be wanting to buy me things you’ll love it so much. Shall I send you a list of my favorite chocolates? 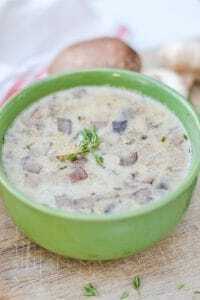 Many mushroom soups are cream based and thick, and this one is too! It is a little bit better for you than your standard cream of mushroom, however. 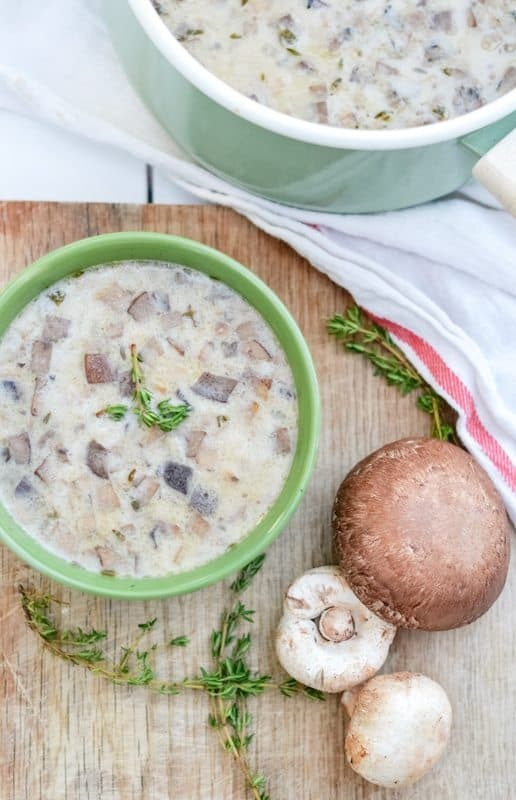 This mushroom soup is filled with good for you ingredients and a lot fewer fats and calories than other versions. It is one of those soups that you will want to make because it tastes amazing, but you will still be feeling good and healthy(er) after your second or third bowl. If you can at all help it, don’t skip the liquid smoke. Here’s a link to buy some online if you can’t find any locally. If you don’t think you’ll like it…use 1/2 the amount and give it a try. You’ll be sold. It’s a simple additive that really makes the flavor of the soup bolder and more delicious. If you don’t like it, however, it’ll still be a delicious soup! It’s best to use 2 kinds of mushrooms…portabello and button. It makes it feel more upscale. No really, it makes the soup more complex and just better. So, liquid smoke and 2 kinds of mushrooms. Got it? See…that wasn’t too hard! You got this gourmet thing! 1 package button mushrooms 8oz 1 package portabella mushrooms (6oz) --this is adaptable to what you can find. A little less or a little more is fine. If you want to use 3 kinds of mushrooms...kudos! Add potatoes and chicken broth. In a small bowl mix flour and half and half together. Bring soup to low boil, beat in the flour and half and half mixture. Let thicken for a few minutes then remove from heat. If you have an immersion blender I would recommend giving this soup a good blend. 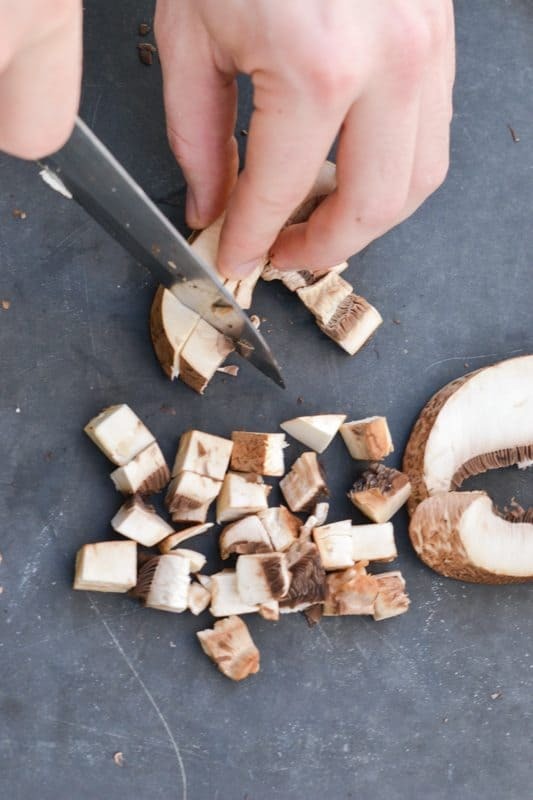 Blending this recipe into a bisque is delicious and brings the mushroom flavor out even more! I want to make this for a dinner party tonight, but I have a friend who must eat gluten free. Do you have a recommendation for a replacement for the flour? Thanks! I’m sorry that we didn’t get this answered in time for your party! Did you find an alternative and, how did it turn out? 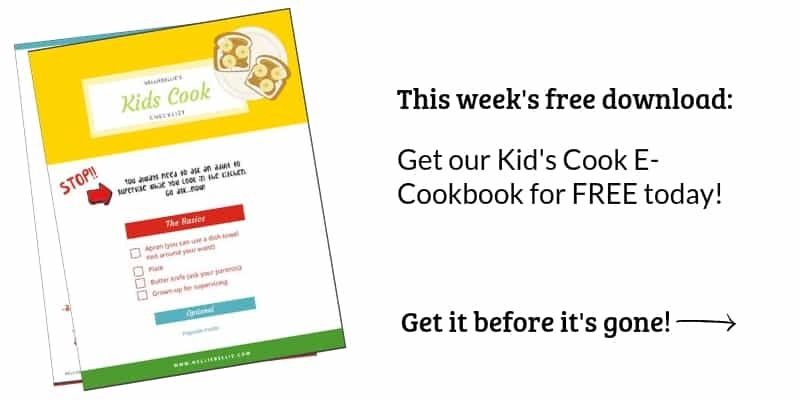 We would love to include that tip on the recipe! I made this yesterday and there isn’t any left! It was delicious!! I’m so glad to hear it! Mmmm…I think I shall join you and make a batch!